Gildor I need your help ._. First of all thanks so much for the importer script for .psk files! It works awesome. One thing I noticed though, the imported models seem to have lighting seams on where there's more than 1 UV coordinate for a vertex - I then analyzed the script and it appears you made it this way, to create as many Points as Wedges even if duplicates, so 3ds max can't smoothly light those surfaces. However it appears TERA models (at least those I tried) have no smoothing groups? So this way the object becomes faceted. I can use Auto Smooth option of course but that smooths even the object's intentionally rough edges. How does umodel know what to smooth? Because in umodel the characters aren't faceted. Anyway, here comes my REAL issue now. 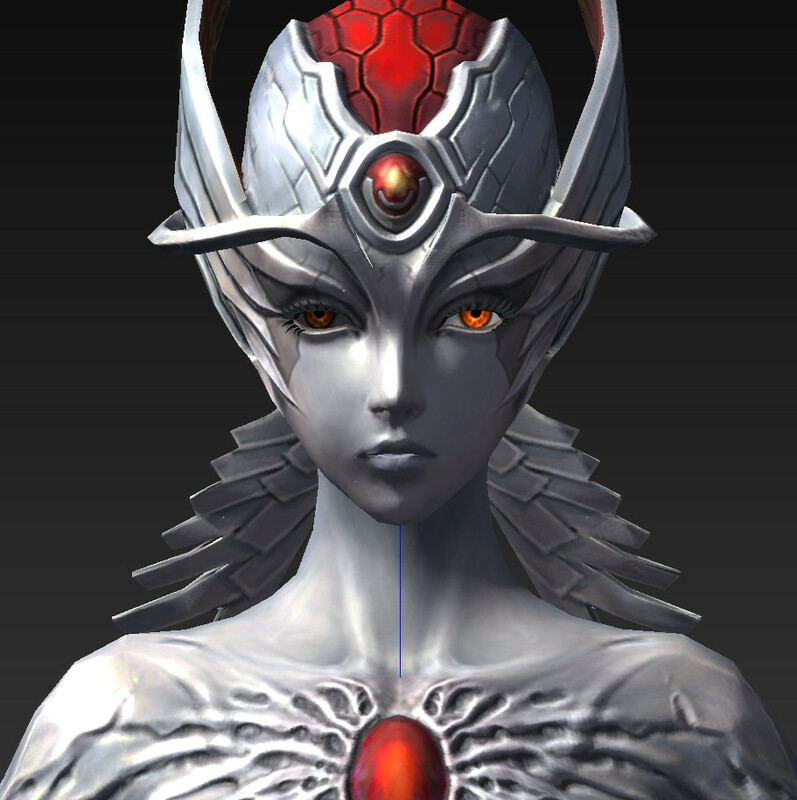 I'm having a problem with the Normal map on my TERA models rendered in 3ds max, at symmetry points. I want to make a video with them so how 3ds max renders them is crucial. 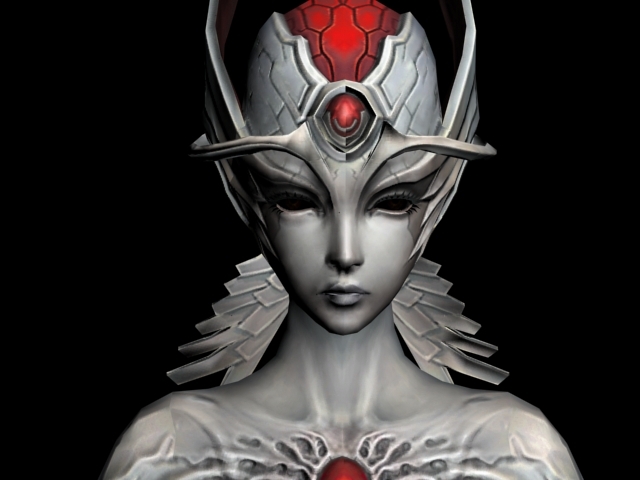 As you can see there's a seam on her right shoulder and on her head the lighting is inverted in 3ds max. I noticed that her right half has the UV .x coordinate increased by 1 unit, between 1.0 and 2.0 instead of 0.0 and 1.0. So I thought, umodel uses a shader to flip normals on such UV coordinates. I manually inverted the Green Channel of the Normal Map for her right half, and it looks flawless! Another character I import, he does NOT have the .x coordinate of his right half increased by 1 unit, and same graphic issue is present in 3ds max. But in umodel it looks flawless! 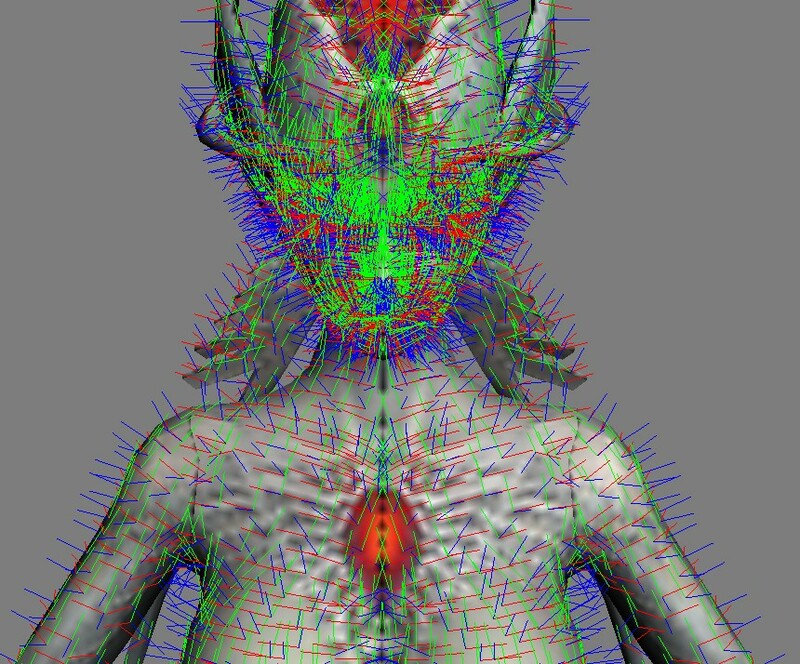 Even worse, he has more symmetry meshes along his body - he has a rotating sphere on each of his arms - and they are symmetric, so he has even more UV flips, and I couldn't even fix those spheres by inverting or swapping Red/Green channels of the normal map, their normals are messed up at the symmetry intersection. The characters display PERFECT in umodel, and since you made umodel (or am I wrong? ), I need to know how do you generate the normals / tangent / bitangent from a .psk file because according to your script and data structure - psk doesn't hold Normal information, only smoothing groups. PLEASE help I'm desperate, 2 days of non stop browsing about this issue and it's driving me crazy. How does umodel display them perfectly?! What is the secret? What's the code it uses to generate normals and tangents/bitangents for normal maps? I'm almost sure the problem is the tangent space, because if I set the Normal Bump sub material to Screen or Local XYZ, it does not display any artifacts at the symmetry intersection - it looks perfect, as it should. So my guess is that 3ds max's Normal / Tangent / Bitangent are messed up for imported .psk files, at least for TERA. How can I get them to be like in umodel and look flawless? I understand your code, but unfortunately I can't test it by myself because I don't have Max installation for quite a long period of time. If this code will be confirmed to work well by other users I can integrate your changes to importer. Smoothing groups are not exported because they are missing in Unreal model data - this "feature" (mistake of the nature ) is unique for 3ds Max and of course not used in game engines. It's simple. I generate normals for UE1-UE2 meshes, and use prepared normals for UE3 meshes. As I mentioned above, I have 2 approaches for normals - generate them from geometry and UV space, or use prebuilt data. Generating normals in Max Script would be very slow task. As you know, PSK format doesn't have a place for normals. It has place for SmoothingGroups, unfortunately it looks like impossible task to regenerate smoothing groups from mesh's normals - I can easily find cases when mesh has normals, but it's not possible to reproduce them using smoothing groups. FBX format has normals stored, and they can be exported/imported, but that's C++ plugin, not script. I linked this post to my forum, maybe some max ppl can test and use this. Thanks alot! You said "smoothing groups are not exported because they are missing in Unreal model data", so what's that 32 bit value SmoothingGroups in the .psk format? I thought .psk has smoothing groups. But if it has normals in it instead, I think it's better. Because as you said smoothing groups is not a great way to produce normals, you can't generate smoothing groups from normals because explicit normals have more control. But smoothing groups aren't needed even for 3ds max I think, 3ds max has Edit Normals modifier which lets you control them so I think I can with MAX script too. "As I mentioned above, I have 2 approaches for normals - generate them from geometry and UV space, or use prebuilt data." 1) How do you generate them? I don't mean a literal max-script, just the general idea in some pseudo code, maybe I can translate it to MAX script. if( mapNormal.z<0 ) // is the UV face flipped? The problem is I can't find a way to manipulate the tangents / binormals in 3ds max at all, I can only let it auto-generate them? 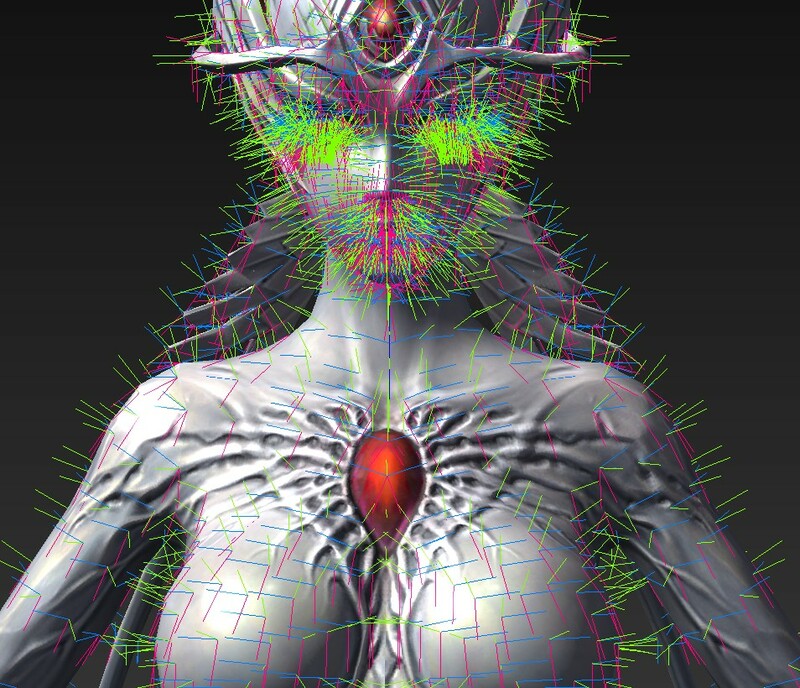 This wouldn't be an issue if it did it properly, but for some reason it doesn't, at least for TERA models. And I have a feeling the issue of my inverted lighting on one half is because of the binormal not flipping, but I am not sure. 1) I am using an older version of MAX so any idea if a newer one lets you manipulate tangents and binormals, or it doesn't? 3) If it's not the normals being at issue, then what else is wrong with the generation of tangents and binormals, something which umodel doesn't have problems of, but 3ds max does. What's the 3rd value of the array [ ] for? And why is it 1-w.V same as 2nd ? Could it be that the problem for when MAX auto generates tangents / binormals from UV coords, or am I completely off the point? As you can see, the binormal in 3ds max is flipped compared to umodel - why? And how can I fix? Is that why lighting is inverted on the model's right half? Or something else? Sorry for rushing last post, I modified my maxscript a bit so it calculates and displays tangents for vertex instead of face, like umodel does, for a closer comparison. Result is still the same though, binormals are flipped and point in another direction. Now the normals/tangents/binormals appear exactly as umodel displays them! because the same problem is still there inverted lighting on the mirrored half. WHY is this happening in max but not in umodel? What's going on? I'm totally out of ideas. Is it because I use an older max and it uses a different (worse) tangent space calculation than the one I found in the SDK on web? Could someone who has a newer max confirm for me? If you're willing, import a symmetric TERA character model (or if you want my exact example case, extract MessengerOfSandramanaia.gpk found in CookedPC\Art_Data\Packages\CH\Monster folder), and then look at the mirror edge in the center, disable view of diffuse and other maps except Bump to make it more clear, and Render. Is the lighting inverted like in my first screenshot, or it looks flawless like in umodel? Tangent space building code should take into account possible mirroring. Tangent should look at direction of growing U, and binormal - in direction of growing V. These 3 tangent vectors are not always right-handed or left-handed coordinate systems. I understand but how do you detect the mirrored half? I made it manually (because in this particular model, the right half U's coordinate is set to 1+) to swap the U coordinates of the right half (to 2 - U), and then flip the texture for the right half so it matches the new U coords. Result was the texture was applied as before for both sides, but tangents were flipped on the right side and... it looked perfect. However that's as much of a fix as swapping green channel and it's not a great way for other models. Some models don't even have the U coordinate modified for the right side to 1-2 range. How does umodel detect the mirrored half to display them perfect? Can you show me the formula umodel uses for tangents for TERA models (uses unreal engine 3) or is it top secret? EDIT: one more thing; since .psk has smoothing groups only and not normals, can you make umodel export some improved custom .psk that has normals instead? Since it appears you know the skeletal mesh format for it. Even if it's a custom format, I could modify the max script to make it import the normals from the new custom format and apply an Edit Normals modifier or something, not sure yet. Ah one thing about the modifications on first post, they work well for max because max can have more than one tangent / binormal / normal per vertex - but if you want to export meshes to some game engine that only supports 1 tangent per vertex, then that method of having 1 vertex at UV seams fails, since you need 2 tangents and binormals even if only 1 normal. So another solution is to use the default way of having more vertices at same spot, but modify normals manually at seams with Edit Normals modifier. Note that this option only works if you export the mesh to some format that saves 3ds max normals, otherwise there is no point to it, and you'll have seams from default normals. Code modifications from first post = good if you use in 3ds max or export to a format that doesn't have normals data. In this case when you import to an engine that doesn't support more than 1 tangent per vertex then you'll have a few artifacts on the lighting from normal map because of 1 tangent / binormal at UV seams, but otherwise you'd have lighting seams from the Normals themselves, anyway, so in either cases it looks bad. This one also uses less memory because of fewer vertices. These new modifications = good if you export to a format that saves normals data. It will allow you to have 100% smooth seams since you'll have smoothed normals and more than one tangent/binormal at one spot when needed. Note that I also pushed the update newMesh line above there, and removed it from original position under skin modifier. This is so it doesn't recompute the normals for the mesh. I also attached the modified script if you're interested. I know that this is a bit late (1.5 years passed since this discussion), but I've integrated patch from recent post of this thread into ActorX Importer 1.30.